Here's how to place a custom order. email us your selections from the categories below. We'll email you a proof for your approval and a PayPal invoice. Send payment and your custom pieces will be on there way. Wood with coarse grain such as Oak will have a more severe texture to the engraved area than a wood with smooth grain such as poplar . Horizontally running grain is the default. Corner blocks are usually specified thicker than the adjoining molding. Corner blocks are usually specified wider than the adjoining molding. If ordering matching blocks for door base, specify Plinth block with height. When choosing routed corners, thicker blocks must be selected so the adjoining molding still abuts a flat edge. Default is a square edge (no profile). or email a high resolution file. 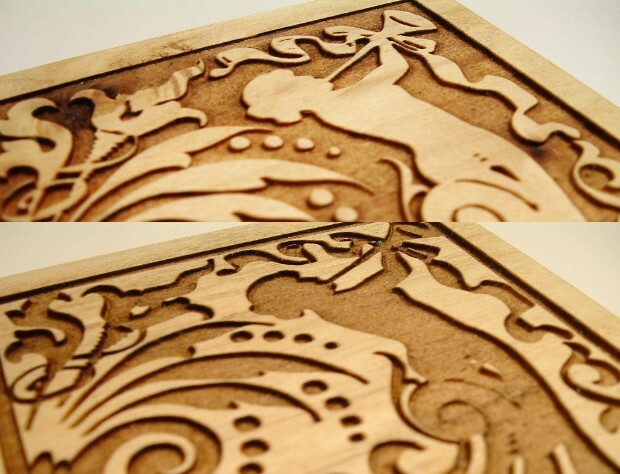 Engraving results are dependent on image quality. A vector file (EPS) or 600 minimum dpi resolution at the desired size is best. Engraved: Shaded portion of image is engraved into the surface. Standard depth is approximately 0.04" (1mm). Nominal charges apply for greater engraving depths. Relief: Inverted from an engraved image. The subject of the image is flush with the surface while the background is engraved into the surface. Asymmetric designs can be order in both "right" and "left" (mirrored) orientation. Specify the number of each, if applicable. 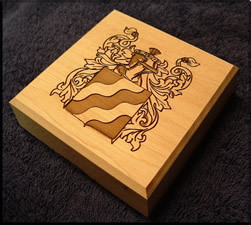 Order 20 or more blocks of any one design and receive free setup.